Over the next few months my bloods continued to go up and down, meaning that I regularly needed blood transfusions at Hull Royal. The community nurse would come to my home and access my portacath to take some bloods. The blood would then be taken to a lab at Hull Royal and they would call back a few hours later, telling me whether I would need to come in for a blood transfusion. More often that not I did, usually requiring red blood cells or platelets. It would usually take a good few hours for me to arrive in Hull and then for the blood transfusion to be set up. On a number of occasions I would arrive at the hospital to be told that the blood was having to be brought over from Leeds, so was still somewhere on the M62! and it would never be enough! I really can't stress enough how vital having these blood transfusions was for me at the time. If my level of red blood cells fell below a certain level my organs would start to fail, and if I didn't have enough platelets I would get internal bleeding as my blood would be unable to clot properly. That's why it's so important for people to donate blood. I'm just one person who it was vital to and there are many other people who require blood on a daily basis. If you haven't already done so, please donate blood, it's really simple to do and it doesn't hurt at all. I had my next lot of scans and they came back saying that everything was stable and that my tumours were still the same, but nothing new had grown. I went to St James' Hospital in Leeds to meet my radiotherapy consultant because I was going to be having my radiotherapy there. It took roughly an hour and forty-five minutes to get there and I was to be going back and forth to here everyday for six weeks when I started my radiotherapy. Because of the high dose chemotherapy I was told that I couldn't have radiotherapy to my head or lungs because having the radiation pass through would damage my brain and lungs too much, causing my lungs to solidify and my brain to stop working in certain areas, causing me to lose my mind. I would only be receiving radiotherapy to my main tumour, on my right iliac bone, part of my pelvis. 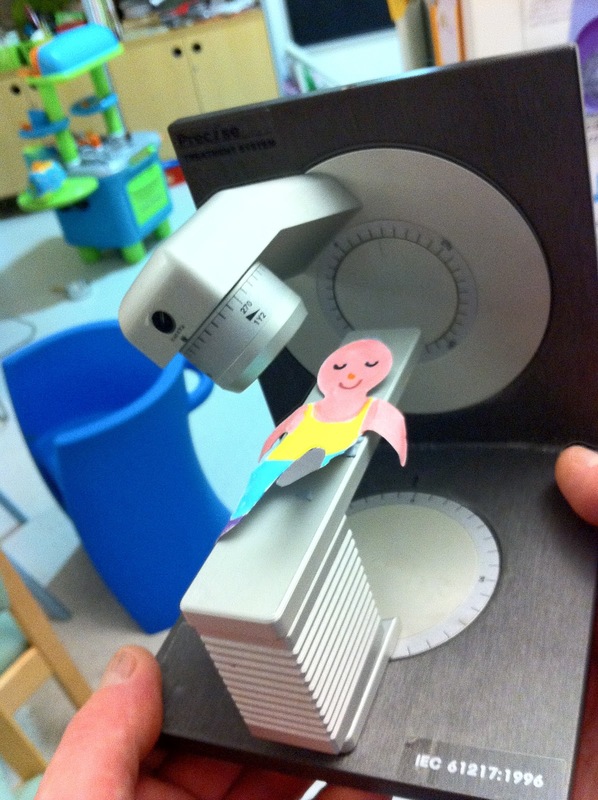 How they explain radiotherapy to kids! I was lined up on a radiotherapy machine and given a CT scan, to ensure that the whole tumour was hit with the radiation. I was also given four small tattoos, which then lined up with lasers to ensure that I was always in the correct position when receiving my radiotherapy. My bloods started to go back up and I was booked in to start my radiotherapy at the beginning of June.